Here's the lovely MORWENNA TOP! Made fromsoft, slinky Cotton Lycra, it's worn off-the-shoulders; and has utterly amazing sleeves - they're gathered at the upper arm, then fitted at the elbow, with a lovely flowing gathered cuff.<br> <br> It's shown here in both White Cotton, and in Black Cotton - and is worn with our Lunalily Skirt and (in some pics) the matching Morwenna Underbust Bodice! It's available in all of our regular cotton shades; and can also be made in crushed velvet, see the colour choices below! Here's the lovely MORWENNA TOP! 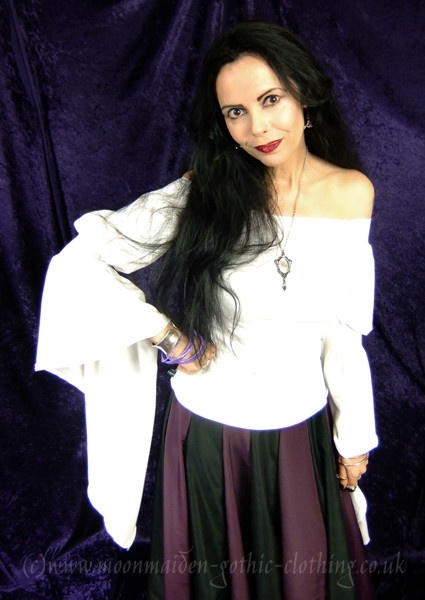 Made fromsoft, slinky Cotton Lycra, it's worn off-the-shoulders; and has utterly amazing sleeves - they're gathered at the upper arm, then fitted at the elbow, with a lovely flowing gathered cuff. It's shown here in both White Cotton, and in Black Cotton - and is worn with our Lunalily Skirt and (in some pics) the matching Morwenna Underbust Bodice! It's available in all of our regular cotton shades; and can also be made in crushed velvet, see the colour choices below!